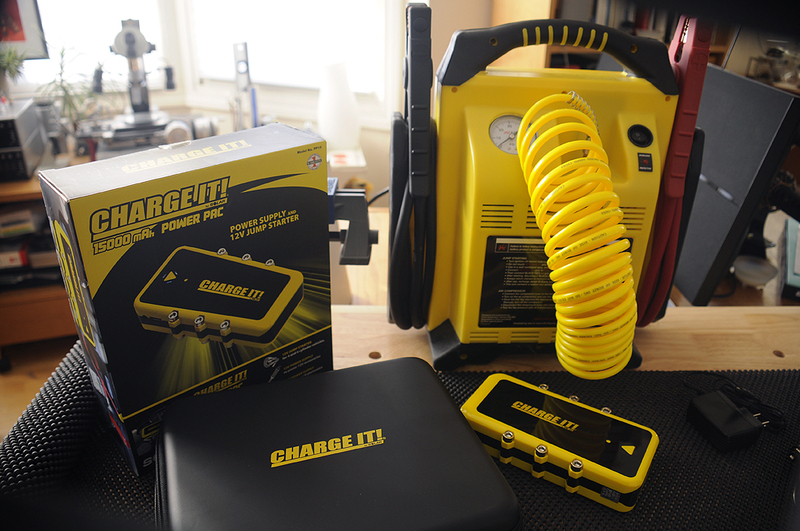 Home » RainyDayGarage » Clore Automotive CHARGE IT! It has been one crazy Winter in New England. Temperatures had been above normal since November, then BAM! it dropped to -8ºF for a few days, and WHAM! back up to 50ºF+ a few days later. With the temperature dropping to extremely low levels, if a car has been sitting outside for a few days, the drain on the power of a car’s battery may make what’s left insufficient to start the engine. 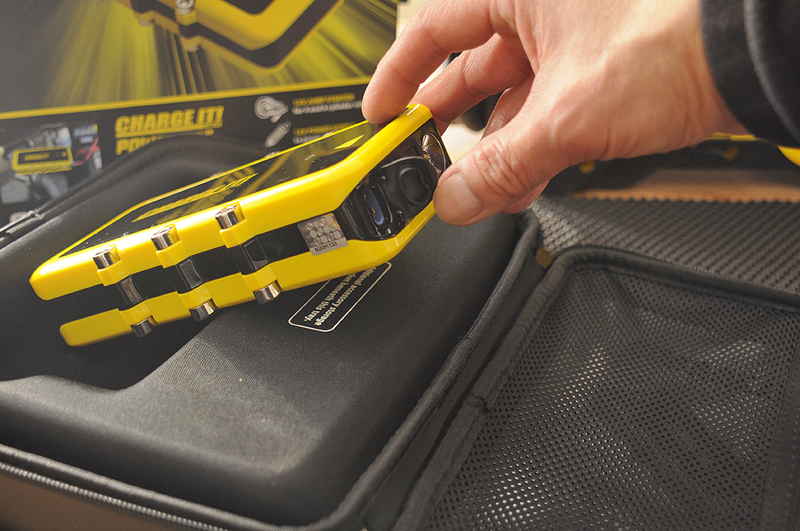 Thus we thought it timely to take a FirstLook at a gadget we think is perfect to have on hand… just in case. We previewed Clore Automotive’s CHARGE IT! Model PP15 15000 mAh POWER PAC last Fall. Folks here have seen their share of rechargeable battery packs, but even they were impressed with that little portable power house. This is because, while like other external batteries the CHARGE IT! can top up gadgets (cell phones, cameras, etc), it also has enough juice to jump-start a car. The CHARGE IT! 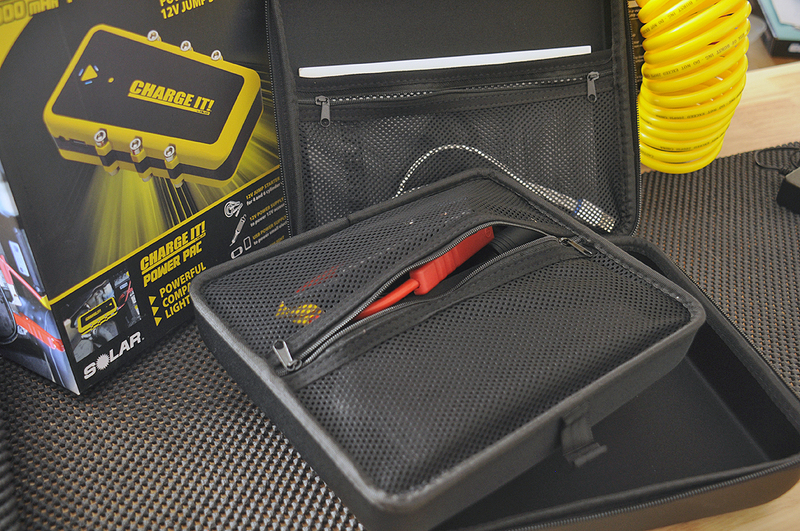 is a lithium-battery based multi-voltage power supply and 12 Volt jump-starter. 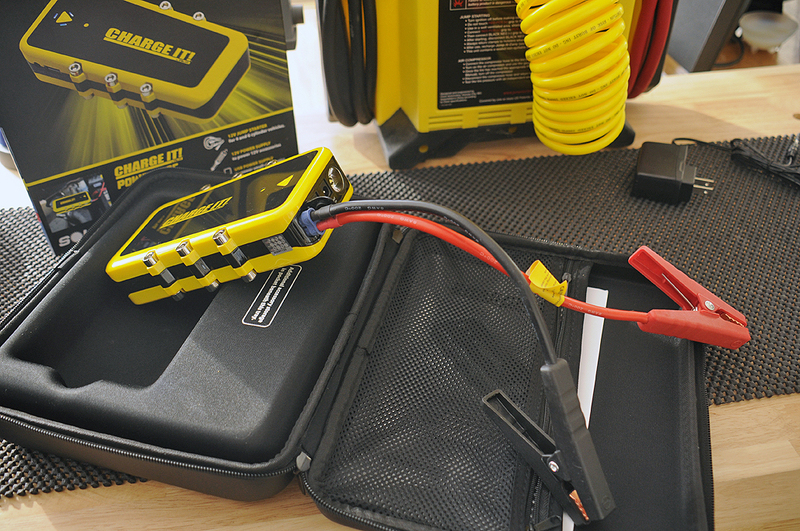 It can be used to jump-start vehicles from motorsports equipment, personal watercraft and ATVs to cars, trucks and SUVs. Being able to deliver 400 Peak Amps and 270 Cranking Amps means it is powerful enough to start most 4- and 6-cylinder passenger vehicles. The terminal clamps and cable of this CHARGE IT! unit are “beefy,” unlike what’s available on some of the less expensive units on the market. This is important as the amount of current needed for jump-starting a car is relatively large and can even melt the wire if the wires are not sufficiently robust. Nothing is more frustrating than a missing cable, plug, or charger when you need it. Perhaps this is why the case was designed so all of the accessories may be neatly stowed in the various zippered compartments in the supplied case. Nice to see the folks at Clore thought things through when putting this kit together. The input and output sockets are clearly marked on the sides of the CHARGE IT! body. Along the long side of the body is the 14V input socket and the 5V USB out socket. The rest of the output sockets (19V, 12 V, 12V Jumper) are at one of the narrow ends. 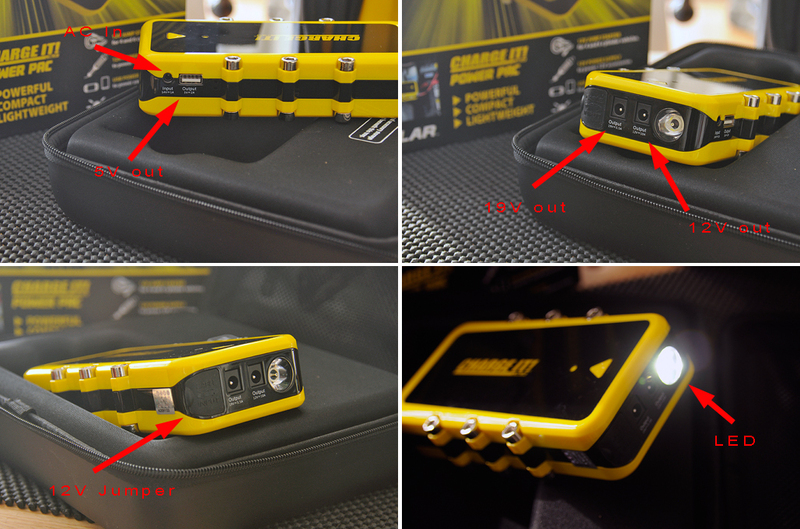 Next to the 12V out socket is a multi-mode LED light, useful both as a signaling device (fast/slow blinking modes) and a flashlight. There are other Li-ion power pacs which claim to be able to jump-start cars in a pinch; however, reports from the field have been rather negative about them. Many of those battery packs have not held up to the physical demands required to handle the amount of current which must be pushed through the cables to get a car to start. While the CHARGE IT! won’t be replacing the JNC Air in the RainyDayGarage, it will definitely be in the trunk of the Boxster when we venture out from now on. 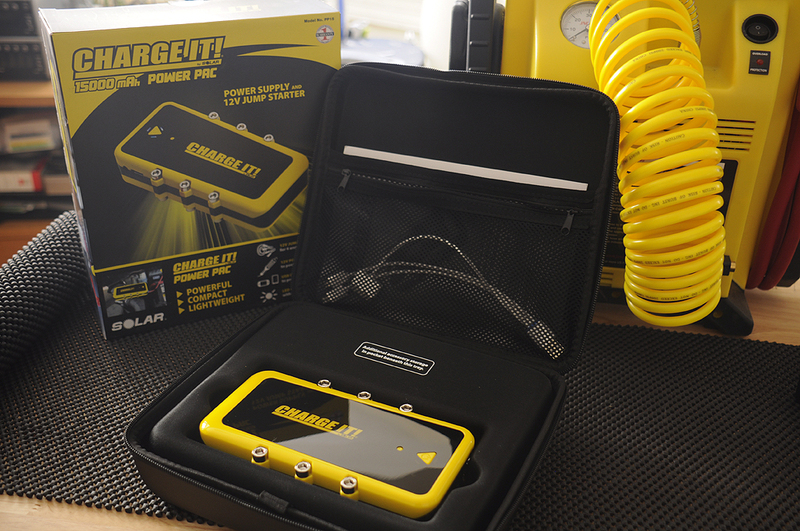 If you like the idea of always having a power pack in the car that can not only revive a dead gadget but get the car going if the lights got left on, then Clore Automotive’s CHARGE IT! is what you have been waiting for. One can never have too much power, right?